As I pretended to be some sort of tap-dancing virtuoso despite having no clue, I secretly wanted to carefully manage my kid sister’s tap-dancing career. I would take a pushy parent kind of role bypassing the fact I had no knowledge of the dance world or the fact my sister was only doing it for shits and gigs. When she decided to give up on her (my) tap dance stardom I was secretly relieved. Let’s be honest, I can barely manage my breakfast on a morning. As a child and in my early teens I had several dreams that one day I would become – a gorilla trainer, a pro wrestler, a stand-up comedian, a journalist, a footballer, did I mention a pro wrestler? Over the years most of these dreams fell by the wayside. Once I finished college at the age of 18, I decided to make one last ditch attempt at becoming a pro footballer. I proceeded to write to all football league clubs asking for a trial – despite never playing for team at any level and doing ICT at college. As you can imagine I didn’t receive any trials and my Stepdad needed to sit me down and inform me I would never become a footballer (not with that attitude!) but do you have a rejection letter signed by Jose Mourinho? That being said, I now feel the need to live vicariously through my children’s clear, early (albeit biased) giftedness. During Ayla’s first year I was convinced she would become a strength athlete of some sort. Now having Daniel, who can perform a sit-up from his bouncer chair, I feel they could become the UK’s first brother-sister World’s Strongest Champions. They both seemingly possess superhuman strength and strangely both kids have shown a strange interest in watching every single day of the World’s Strongest Man on TV since birth. As many of you may have seen, Ayla started her music career at a very early age and has developed into a keen vocalist with the moves to match. With her recent Christmas gift from her Uncle Steve, who is an amazing musician himself, I feel she’ll be ready to form her own band within the next year. Obviously I will manage her and maybe we’ll end up like one of those father-daughter duos that sing together on talent shows. We do a mean ‘Light’ from Tangled duet. I think Ayla could be an all-singing, all-dancing, Fred Astaire type. Ayla’s great-great-grandmother was a stand-up comedienne around the social clubs of Sunderland. I must say she has great charisma, wit and comic timing at the tender age of two. When asking Ayla her dreams for the future she would like to be Rubble from Paw Patrol. I know he’s only just gone 6-months-old (HAPPY HALF-BIRTHDAY SON!) but if Daniel Jr remains as affable and chilled as he currently is, he could definately win a Nobel Peace Prize. In my ultimate dream he’ll have a love for football and I’ll play agent as he plays as Sunderland’s superstar striker. On recent form he could do a better job now than some of the so-called professionals at the club. His goals will guide our beloved Sunderland to four consecutive Champions League wins, I’m sure of it. His current ambition seems to be rolling away from any nappy change that comes near him. I wonder if there’s any speed world records for sausage rolling the length of the living room. Alternatively, I am confident he could go all the way in the World Stareout Championships. I feel I will be more purposeful in helping my kids reach their goals than I was with my own. I’ve always somewhat admired the strict, disciplinarian methods of the ‘pushy parent.’ Who couldn’t be impressed with Richard Williams’ compiling an 80-page dossier on training both his daughters to be grandslam tennis champions or more recently LaVar Ball talking all three of his sons to be pro basketballers into existence. It’s hard not to admire this competitive parenting style. That being said, ‘Born winners’ can sometimes come hand-in-hand with absolute jerks. That single-minded determination, while obviously a good thing, can bring out traits that don’t necessarily appeal to the everyman. In focusing on the kids’ upbringing at the moment I prefer to joke and act childlike ALONGSIDE them. Thankfully my wife’s talents as an experienced early years teacher means she can handle all three of us whilst helping them develop through the various areas of early learning. To date this has allowed me to play good cop with the kids. Don’t get me wrong I do enforce rules with our toddler but I feel I give the right level of input as to accept no responsibility if things go catastrophically wrong. To that point, in Ayla’s first year she managed to record both ‘Snapped: Women Who Kill’ and ‘I Could Have Gotten Away With It’ off the Crime Investigation channel. I’m only watching my back. 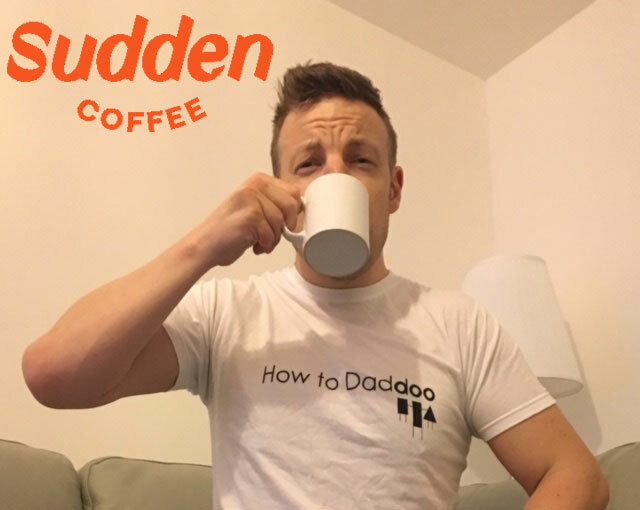 I guess in conclusion my advice to fellow Daddoo’s would be to take each day as it comes, do your best, encourage and praise your little people in all areas, follow your instincts – the rest will fall into place. I think true success in life comes down to how happy you are. Not the money in your bank account, a glittering career or how many followers you have. If we can simply make our kids happy, and instill in them a dream big and do your best attitude, they won’t go far wrong.